The cuteness is strong with this one. Each year, the Oregon Humane Society holds an annual fundraiser it calls a Pug Crawl. Dog owners bring their four-legged friends with them to a local bar, where there is live music, food and drink, and an extravagant ritual called The Parade Of Pugs. This year, the Society opted for a science-fiction motif for its fundraiser, dubbing it Star Wars: The Pug Awakens, encouraging owners to dress their pugs as little Darth Vaders, Yodas, Ewoks, and AT-ATs. The whole thing went down on Sunday, May 22, at Portland Brewing Company Tap Room. If this all sounds dangerously close to a Portlandia sketch, that’s because it’s happening in Portland. 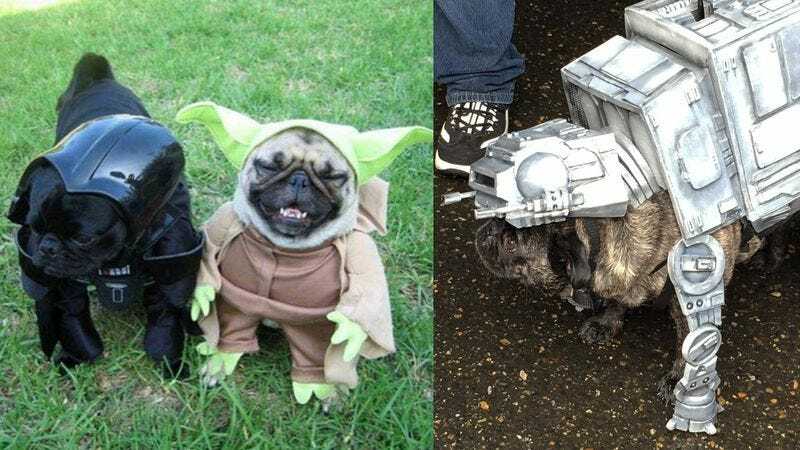 The Oregon Humane Society says that the event attracted “a record-breaking crowd estimated at 2,200 people and 800 pugs.” The combination of Star Wars iconography and adorable, tiny dogs with smashed-in faces proved a potent lure indeed. A panel of judges eventually decided that the best-costumed pooch at the event was Helga The Hutt, a furry little parody of the fearsome Tatooine crime lord. But perhaps even more impressive is the entry that came in second: a 6-foot-wide TIE Fighter piloted by two pugs named Maya and Cash. Never has the oppression of the Galactic Empire been more appealing. For those whose appetite for the adorable has not yet been sated, the Oregon Humane Society has a photo gallery of images from the event here. Curiously, there seem to be no pictures of pugs dressed up as Boba Fett. That’s a notoriously complicated process, requiring a weekend’s worth of work.